Choose from 1 – 1.5 hours packed full of amazing animals and awesome activities at your home or venue. Includes travel to Hibiscus Coast and North Shore suburbs, set-up and pack-up. Travel to central Auckland suburbs is + $45. Small groups are fine too and mean more individual time with the animals. Please respect our maximum guest numbers. Larger numbers compromise animal welfare which means the party will not proceed. 8 years is our recommended minimum age, though we are negotiable with an assurance that children can be calm, quiet, and gentle around the animals. We find the best way to organise your 'at home' party is to have guests arrive at least 15 minutes before our start time – so everyone benefits from our introduction and animal rules. We provide the entertainment and then afterwards have your party food, cake and presents. We just need enough space to have guests (10-12) sit in a circle on our mat with activities in the middle and small cages around the outside. A garage that we can drive up to is perfect, though lounges, playrooms, patios, under trees and even carports work! Keep in mind we have a lot to unload so leaving us a car park and avoiding lots of flights of stairs is always appreciated! Parties are presented in an 'age appropriate' way with parties for older children and teenagers including more animal information but still lots of fun. We also do parties and events for grown-ups - everyone loves our animals! For the welfare of our animals, we require party guests to follow basic instructions around the animals and remain reasonably CALM. This type of party is great fun for most children but will not suit those who have trouble sitting quietly for any length of time. Parents must advise us of any known behavioral conditions of attendees including the birthday child. We may ask a caregiver to sit with any children that could potentially be disruptive or (unintentionally) harm animals. Our parties are a unique and special experience for children because of their hands-on nature, and this requires adherence to guest numbers and appropriate behavior. We take the care and safety of our animals very seriously and will not allow rough handling. Are Animal Parties suitable for the under fives? Pet Parties are most suitable for older children, teenagers and even adults. Preschoolers do love animals, however we have very small and delicate creatures which combined with the unpredictable nature of very young children presents an animal welfare issue. Keep in mind that this type of party involves being calm and quiet and will not suit all children. Is my child too old for a pet party? As long as your child or teenager has an interest in animals, a ZooVenture Party is going to be great fun. We adjust how we present party activities according to age so that no-one feels 'babied'. Information about the different animals is age appropriate and we encourage lots of questions. The birthday person is encouraged to choose their own activities and have as much input as they like into their day. We can also go with a theme such as a 'Reptile Party' where we focus on the many lizards and turtles and other weird and wonderful creatures. We can also run animal care workshops for you. Is it just for girls? Not at all. Boys and girls both enjoy everything from lizard handling to guinea pig hairstyles. Will the children learn about the animals or is it just 'fun'? We love to share our knowledge and passion for animals with our party guests. We have an endless amount of fun facts about all our animal stars and can answer all your questions throughout the party. Your party can also be run 'workshop style' with an emphasis on pet care, reptile keeping, the animal kingdom, or whatever you choose. Will it cost less for fewer children? As we allocate the same time and resources to all parties, pricing remains the same. The big advantage is that smaller groups get more time with the animals and we can sometimes fit extra activities in. Can I invite more than 12 guests? Sorry, no. 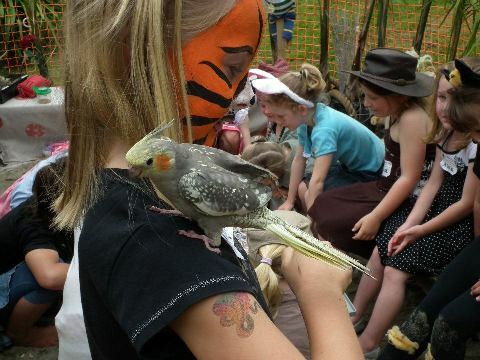 An Animal Party involves a variety of very special small pets and exotic creatures being available for a unique hands-on experience. The animals are small, delicate, some are rather expensive and all are very special. We have a responsibility to the animals to keep them safe and need to supervise all interactions as well as keeping noise levels under control. Large groups become very noisy and are too difficult for the party host to manage safely. What do I need to do before my party? If we are coming to you, please ensure there is a car park available near the entrance to your home or venue. We have a lot of cages and equipment to unload. Please ensure payment is made in full prior to your event. Will the children get bitten or scratched? Our animals are all very tame and friendly and well behaved. Most are also fairly small and can be handled easily. We emphasise the importance of children listening to instructions and remaining calm as it is only if an animal is handled roughly that it may bite. Rabbits and lizards may be a little scratchy from time to time, so children have a cushion on their lap during their animal encounters. We maintain a high level of supervision throughout. 50% deposit to be paid upon booking and remainder payable at least 5 days prior to your event. Cancellation: Cancellations received 4 weeks or more prior to the event will receive a full refund. Cancellations on the day due to illness will be rescheduled as soon as possible when a medical certificate is presented. All other cancellations will result in forfeiture of deposit. All attempts will be made to reschedule should circumstances be out of your control.